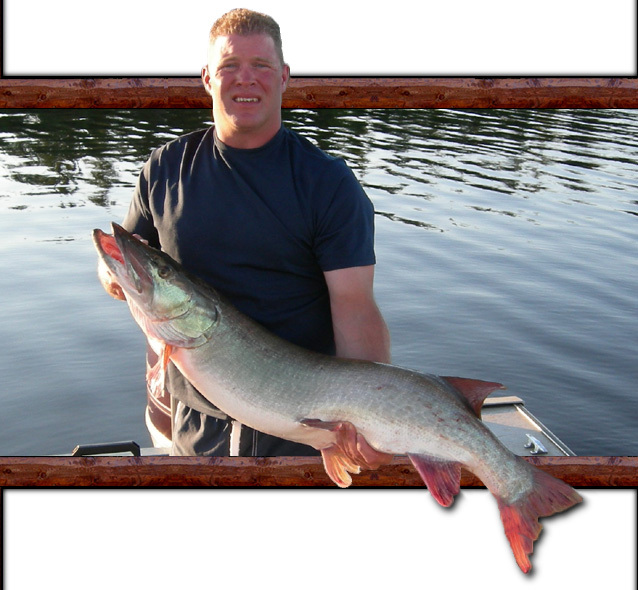 Muskie are found naturally in Lac Seul. They have never been stocked. They were present in good numbers in the river before the dam was built in 1929 and to this day Muskie roam Lac Seul like sharks; eating everything in their path. You may ask why Lac Seul has just started gaining a reputation as a world class Muskie fishery since the mid 1990s. The simple truth is Lac Seul has the best Walleye fishing in the world and that's what people come here for. Generally Muskie fishing has been more popular in lakes that are over-fished because there is nothing else to fish for and the Muskie have nothing else to eat so they are more apt to hit lures. The secret is out and every year we see more and more guests interested in Muskie fishing. Lac Seul is one of Ontario's Best Muskie lakes. The Ministry of Natural Resources conducted a massive Muskie population assessment across Ontario and netted hundreds of thousands of Muskie. They listed fifteen lakes that were capable of producing the next world record and Lac Seul was named in the top five. You cannot expect to catch a Muskie of that calibre but since Lac Seul is a catch-&-release only Muskie lake, you do have that chance. 95% of Muskie caught on Lac Seul are between 32 and 45 inches. 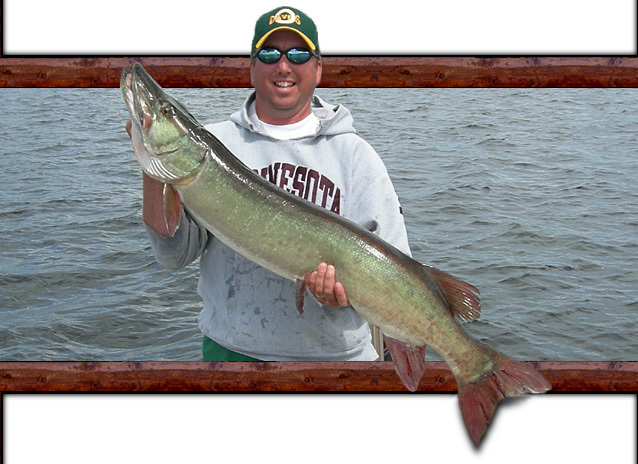 Many of our guests catch Muskie that are bigger with a few in excess of 50 inches every summer. A 50-inch Muskie is not rare and if that's your magic length that you want to break then there is no better place to try and break your own personal record. How many Muskie you will catch in a day is impossible to predict. If the weather stays stable, they are feeding and you purposely target Muskie, you will not only see them but have a great chance of catching one. Practise your figure 8 skills as they are fooled by the tactic more often than not. 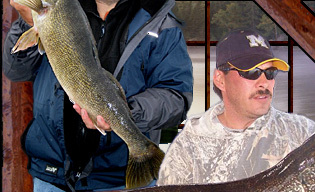 We want our customers to catch tons of fish and have tons of fun so we suggest you fish for Walleye in the morning. Then after lunch go for Muskie. The magic time for Muskie seems to be at daybreak before the sun comes up, between 2:00 and 4:00 in the afternoon and then later in the evening before and after dark. Back in the late 80s and 90s Firetiger was the hottest Muskie color in North America. Everybody was using it. 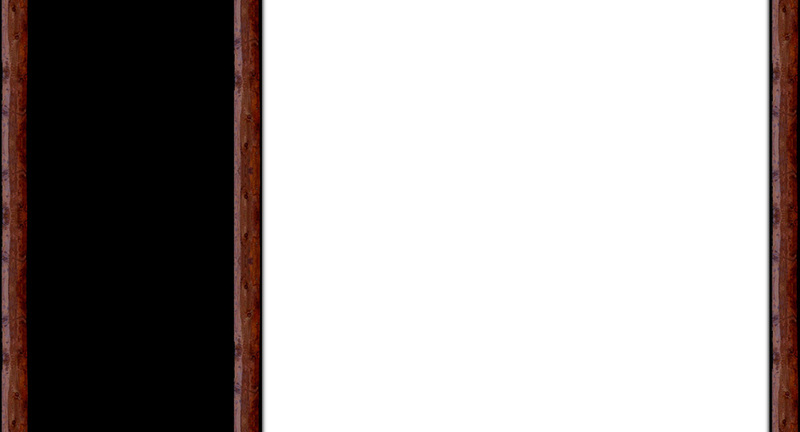 So many people used it that Muskie on many lakes learned not to hit Firetiger. On Lac Seul, there has been very low Muskie fishing pressure. Combining this with the size of the lake, our Muskie do not avoid Firetiger lures like on some lakes and at present Firetiger remains the very best color for Muskie during the summer. In the fall, the effectiveness of Firetiger slows down because the Muskie target more natural colors like Perch or Walleye (gold & black) colors. Silver and black also works well in the fall. 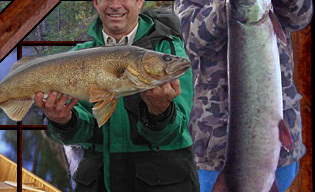 Big trophy Walleyes also go after Muskie lures in these colors. Lac Seul is a great Muskie lake and don't be surprised if you do get a Monster Muskie on your line. After all, there is no better place in Ontario for that to happen.